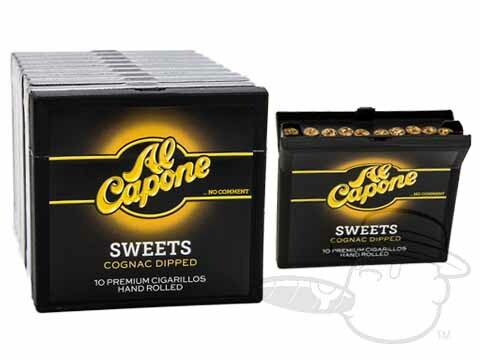 Al Capone Sweets Non filtered cigars originate from Honduras and feature a natural wrapper. These petite cigarillos are a mellow bodied smoke with a sweet taste and tantalizing aroma and are Cognac dipped. The Al Capone cigars are reasonably priced and are perfect for individuals that enjoy a quick, tasty smoke. I've been enjoying these cigars, and the BCP prices for a long time now. Great little smokes at great prices. If you haven't tried these, You really are missing out on a tasty little smoke. We've smoked Sweets for about 15 years. They still are our favorite (we don't smoke cigarettes). Just a hint of flavor and just the right size. Very handy to place my order and receive a few days later. Quality of the product seems to be very good. I was introduced to Al Capone's by a friend and enjoyed the flavor. Al Capone Sweets Unfiltered - Excellent! The best you can buy. Full flavor, medium body, and so nice to enjoy. My favorite! I started with these so I could have a smoke during work break time, now I prefer them to almost anything else. Great taste and great flavor! Wonderful flavor and just the right size! I have enjoyed Al Capone Sweets for several years and enjoy the great taste of a cigar and the convenience of use. I also enjoy a fine cigar in the right setting with time to relax and appreciate a fine cigar. The best cigars I've ever smoked hands down!! Excellent product and excellent service from Best Cigar Prices. A "GREAT" price and super fast shipping! No store again for me. Love Best Cigar Prices!! No need to go to stores and pay high prices again. Very reliable product and service. I like a small cigar twice daily. These are packaged openly in a plastic container. You must be willing to smoke each pack containing 10 cigarillos within 1 week or they will become stale. The best tasting small cigarillo on the market and excellent price at Best Cigars. best small cigar on the market. only down fall is the price. I am very satisfied with this product. It is very smooth and has a good flavor. Sometimes it is hard to pull and is to tight but overall it is a good product. Al Capone Sweets Cognac Unfiltered is rated 4.6 out of 5 based on 26 customer ratings.